One Hour Bread is my new favorite thing in life! But really it is one of my latest go-to recipes. I can’t even count how many times I’ve made it, so it’s due time that I shared it with you! At first it may take you 70 or 75 minutes from start to finish, but once you get the hang of it you can have this bread ready in 1 hour (I’ve timed it)! You just can’t beat that! Fresh homemade bread warm from the oven in 60 minutes! 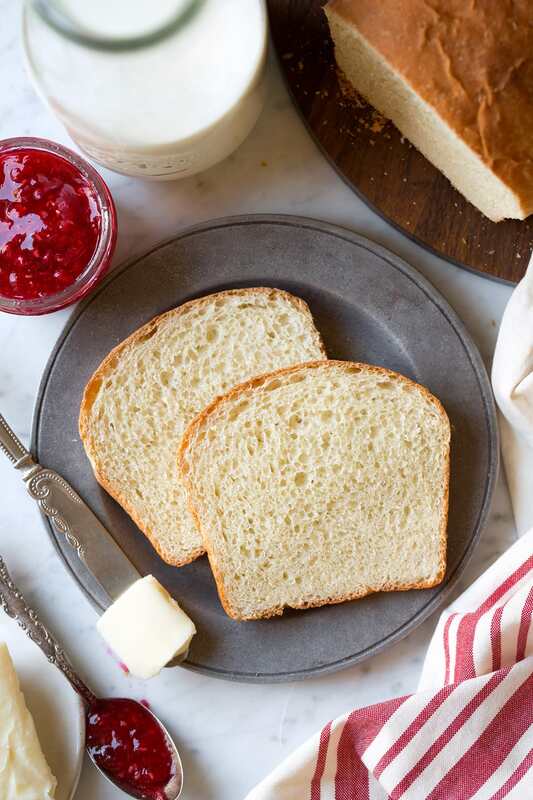 For all of your favorite sandwiches, to pair with that bowl of comforting soup on a cold day, or to make into morning toast with your favorite homemade jam. By the way, the only jam recipe I ever make is this less sugar raspberry freezer jam. It’s my favorite, I’ve been making it for years and there’s no canning skills required. Another great thing about this bread recipe is that it makes two loaves. 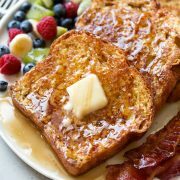 My favorite thing is to save the second loaf for French toast the following morning. 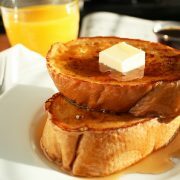 It makes the best French toast ever! Heat water, milk and butter to 120 degrees. Mix flour sugar, salt and yeast in an electric stand mixer. Pour warmed water mixture and lemon into flour, mix on low 1 minute. Knead 4 minutes, while adding a little more flour if needed until dough consistency isn’t sticky. Spray two 8 by 4-inch or 8 1/2 by 4 1/2-inch loaf pans with non-stick cooking spray. 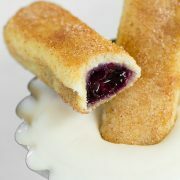 Divide dough into two equal portions, and shape into logs each 8-inches long. Transfer to prepared loaf pans. 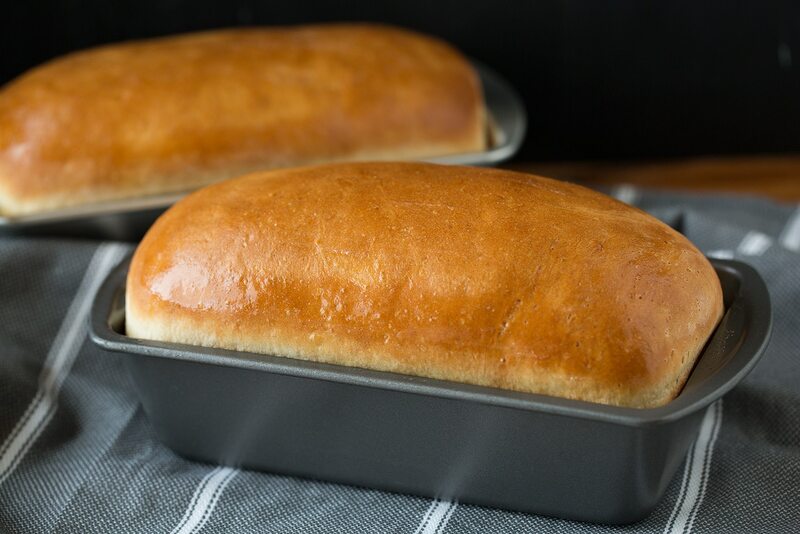 Cover loaves with a large container such as a cake carrier or spray a sheet of plastic wrap with non-stick cooking spray and drape over loaf pans. Let rise until doubled in volume. Meanwhile preheat oven to 375 degrees. Bake in preheated oven until golden brown on top and hollow when tapped, about 22 – 25 minutes. Invert loaves onto wire racks to cool. 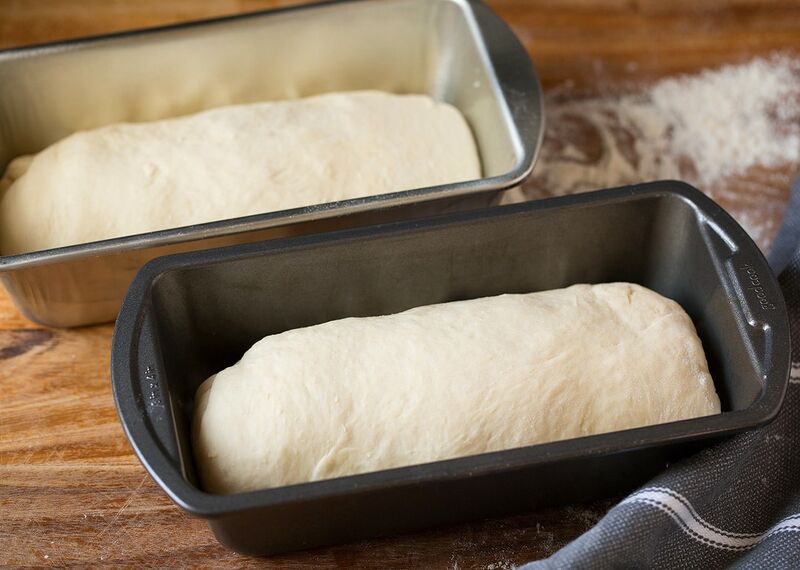 Store loaves in an airtight container once they are almost finished cooling. 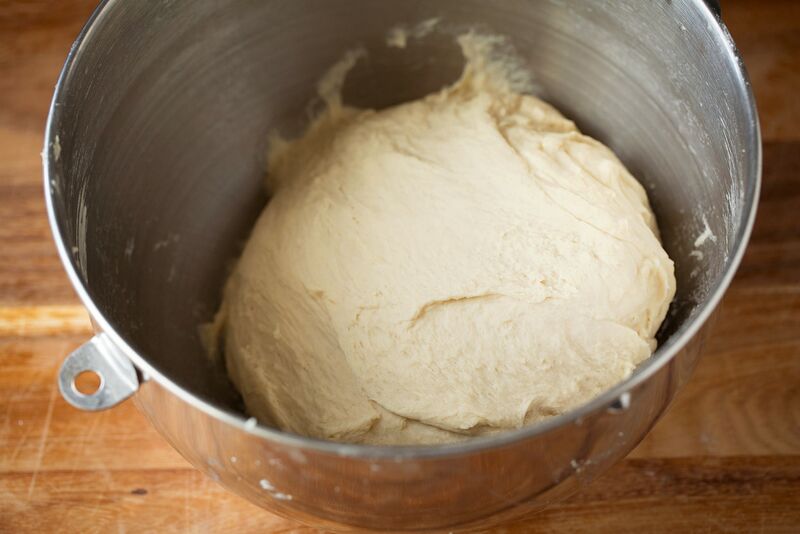 Dough shouldn’t be too sticky or it won’t have enough structure and won’t rise as well. Then on the other hand don’t add too much flour or it might come out dry and dense. Let it rise in a warm place otherwise it can take longer to rise. Really let it fluff up in volume. It should get least double if not more. Otherwise you’ll end up with a dense heavy loaf. 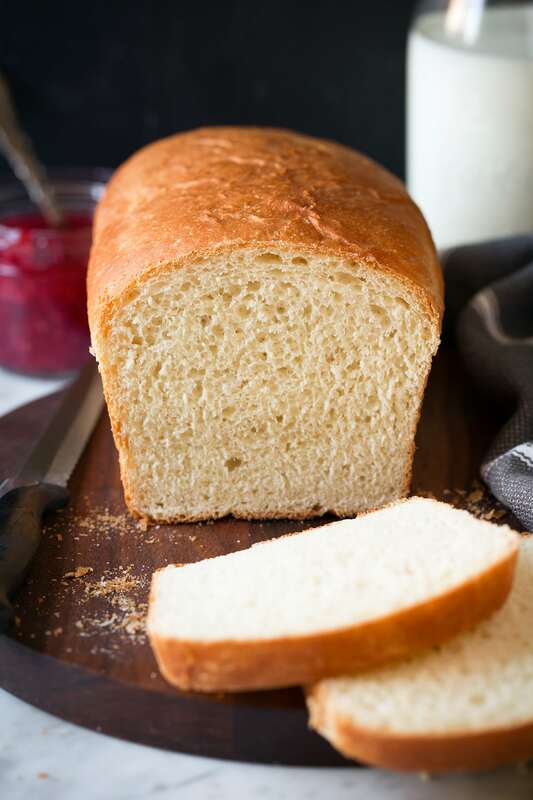 The easiest white bread recipe! Lately I make it more than any other bread or roll recipe, it's so fast and so delicious! Plus, I love to save the second loaf for French toast the next day. Makes 2 small loaves. In a bowl or in a large liquid measuring cup combine water, milk and butter. Heat in microwave until it reaches 120 - 130 on an instant read thermometer, about 1 - 2 minutes (it's okay if butter doesn't fully melt). Meanwhile add 5 1/2 cups flour, sugar, salt and yeast to the bowl of an electric stand mixer fitted with the paddle attachment. Mix for about 10 seconds to blend. Pour warmed water mixture into flour mixture then pour in lemon juice. Mix on a fairly low speed for 1 minute. Scrape dough from paddle and switch to hook attachment, scrape sides of bowl. Set to a fairly low speed and let knead 4 minutes, while adding a little more flour if needed until dough consistency isn't sticky (it can stick to the bottom of bowl but shouldn't stick to the sides). Meanwhile spray two 8 by 4-inch or 8 1/2 by 4 1/2-inch loaf pans with non-stick cooking spray. 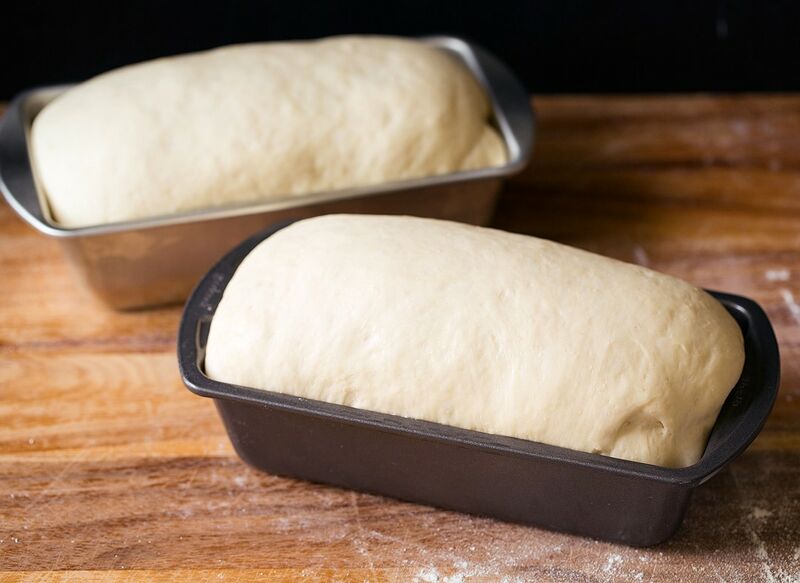 Cover loaves with a large container such as a cake carrier or spray a sheet of plastic wrap with non-stick cooking spray and drape over loaf pans. Let rise until doubled in volume, about 25 minutes. Bake in preheated oven until golden brown on top and hollow when tapped, about 22 - 25 minutes. Invert loaves onto wire racks to cool. zahra: hello madam. i have a question about sourdough starter. how much completely dry starter sourdough is equal to 250 grams fresh (wet) sourdough starter? is there a equation for that?